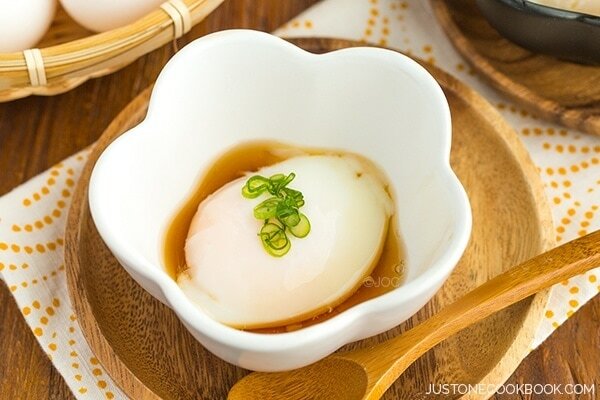 From sweet to savory, there are various types of mochi (Japanese rice cake) we enjoy in Japan. 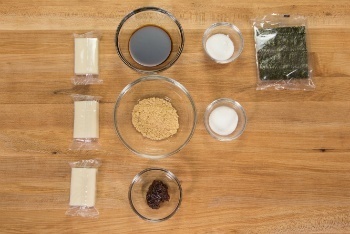 In this recipe I’ll show you how to make mochi in three different delicious flavors at home. 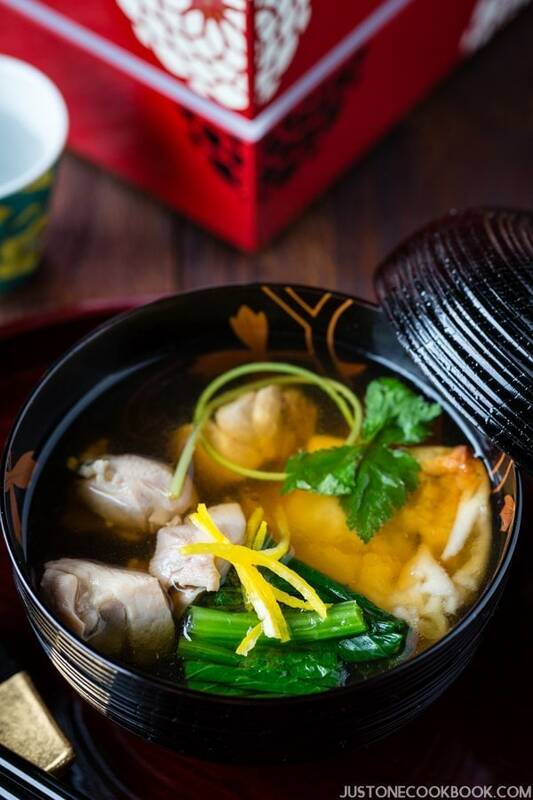 After I shared Japanese New Year soup Ozoni recipe, I received a lot of feedback from my readers regarding the “mochi” I added in the soup. They were surprised that I added “mochi” in the savory soup and asked me if it’s sweet. The feedback made me realized that the Japanese and non-Japanese see the word “mochi” quite differently. 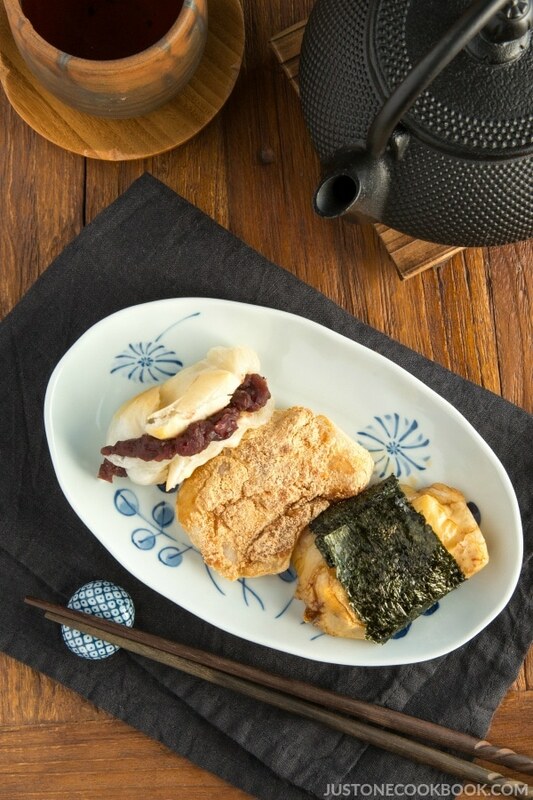 Enjoy toasted Japanese mochi in 3 delicious ways, dip in soy sauce and kinako (soy bean flour), or wrap sweet anko inside. 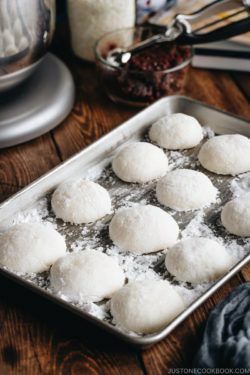 For non-Japanese, based on the feedback I received, when they see or hear the word “mochi” the first thing that comes to their mind seems to be the round stuffed glutinous rice balls. They are usually filled with sweet ingredients such as red bean (more traditional) or chocolate, strawberry, mango, etc for more modern flavors. However in Japan, we usually call these (pictured aboved) sweet mochi “Daifuku” or Daifuku Mochi” to differentiate from the regular mochi. What Is Japanese Mochi (餅)? In Japan, when we say “mochi”, it usually implies to plain mochi – either freshly made or cut packaged mochi available at the supermarkets. Photo credit: (left) Miyuki Meinaka, (top right) Pixeltoo, (bottom right) Kropsoq via Wikimedia Commons. Mochi is a Japanese rice cake made of mochigome (糯米), a short-grain japonica glutinous rice. The rice is pounded into paste (left pic) and molded into the desired shapes such as round shape mochi, Maru Mochi (top right pic). When we eat mochi at home, we buy Kiri Mochi (bottom right pic) that are individually packaged in plastic bags. How To Enjoy Japanese Mochi At Home? The freshly made Japanese mochi can be included as part of savory or sweet dishes. 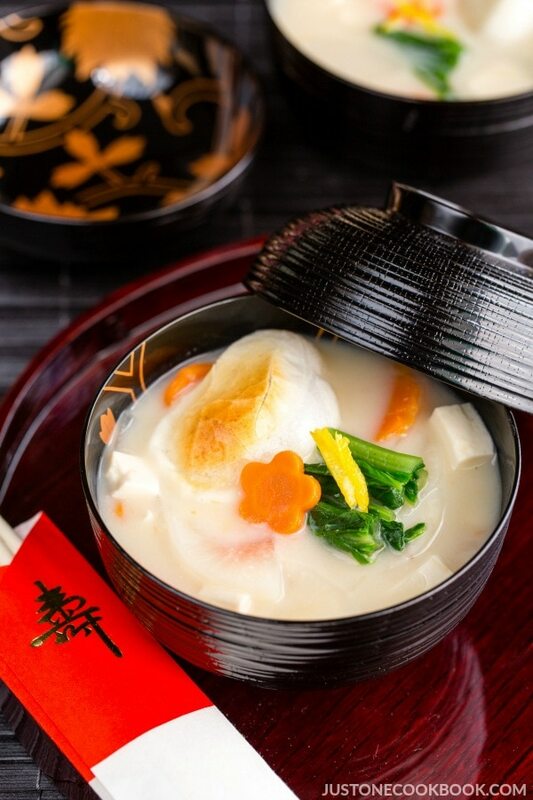 For savory dishes, mochi is used as a topping for miso soup, Ozoni, and hot udon noodle soup (we call this menu Chikara Udon (力うどん)). It can also be added inside Okonomiyaki. For sweets, we use Japanese mochi to make Mochi Ice Cream, Zenzai (Oshiruko), Strawberry Daifuku, and more. Making mochi from glutinous rice takes a long time and effort, therefore most families don’t make mochi from scratch anymore. 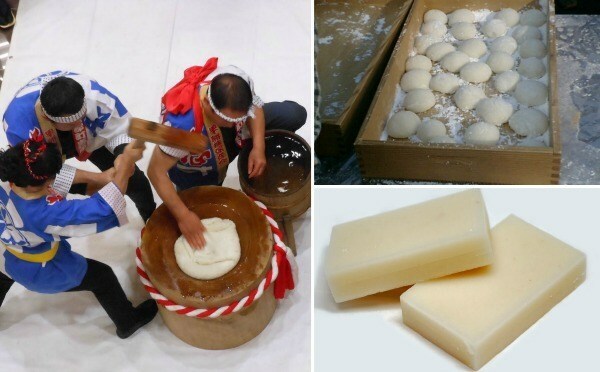 If we want to enjoy freshly pound mochi, we can do so by attending a mochi pounding event or some folks buy a small Japanese mochi pounding machine at home for this task (some of Japanese bread makers has an option for mochi pounding!). These days to enjoy mochi all year around and during the Japanese New Year, we can buy these pre-cut Japanese mochi (Kiri Mochi, 切り餅) from the supermarkets. Today I’ll show you 3 most popular recipes to enjoy mochi using these Kiri Mochi. Each family cook these mochi differently based on their preference. My family (in Japan) love crispy toasted mochi rather than boiled mochi, so we always toast mochi first before flavoring. Read the Note section of the recipe for microwaving and boiling method. Here are the three flavors we make today. 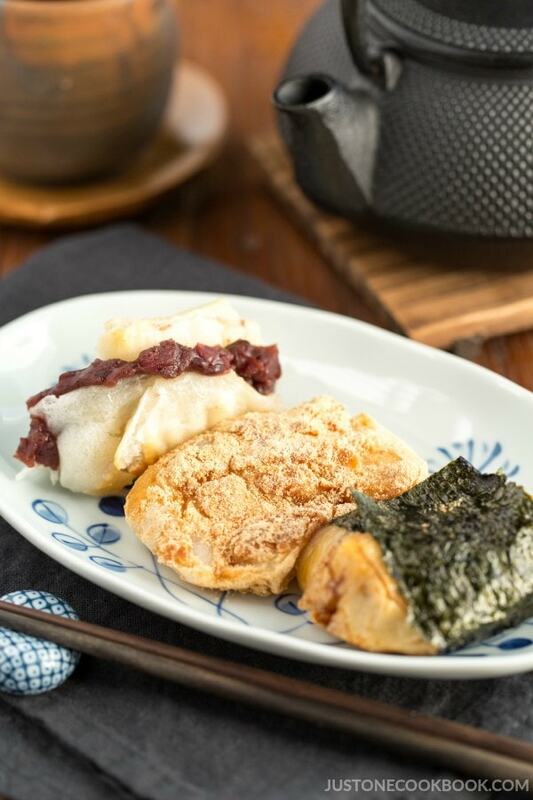 Anko Mochi, Kinako Mochi, and Isobeyaki. 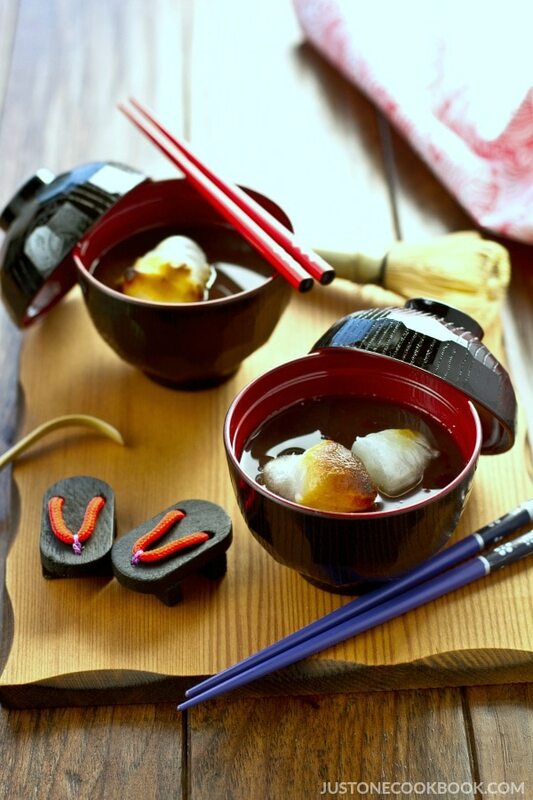 Anko Mochi (餡子餅) is a mochi where we place red bean paste inside the mochi. Kinako Mochi (きな粉餅) is mochi coated with a mixture of kinako (roasted soybean flour) and sugar. Isobeyaki (磯辺焼き) is mochi coated with a mixture of soy sauce and sugar, and wrapped with nori seaweed. Most people prefer Isobeyaki without sugar, but my family always makes it with sugar. I assume this is not based on regional differences, but it depends on family’s preference. What’s your favorite? When I was growing up, I couldn’t pick my favorite… So for the Japanese New Year Day, I used to eat 6 pieces of mochi – 2 in Ozoni, 2 Anko, 1 Kinako, and 1 Isobeyaki. I wish I am young again so I could eat 6 mochi in one sitting without worrying increasing my waist size! Place mochi in a toaster oven and toast until puffed up and golden brown, about 10 minutes (See Note 2). Add 1 Tbsp. of sugar to soy sauce and microwave for 20 seconds. Add 1 Tbsp. 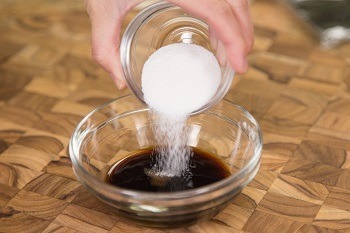 of sugar to kinako and mix well. Gently smash the mochi with your hand. 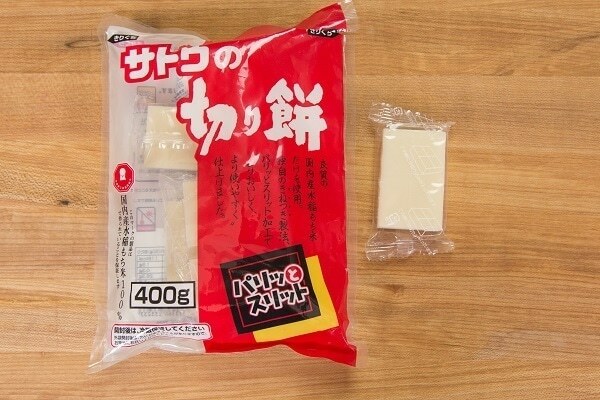 For Kinako Mochi, soak the mochi in hot water, then dredge in the kinako + sugar mixture. 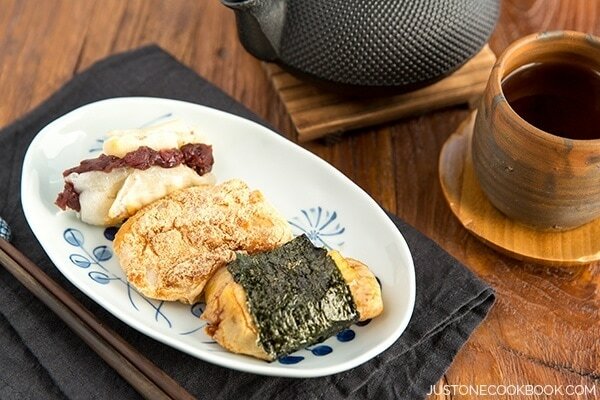 For Isobeyaki, soak the smashed mochi in soy sauce and sugar mixture and wrap with seasoned nori. For Anko mochi, pull the smahsed mochi from both side and wrap around anko. It’s sticky, so be careful when handling. 1: Most people prefer Isobeyaki without sugar, but my family always makes it with sugar. I assume this is not based on regional differences, but it depends on family’s preference. 2: Besides toasting/roasting the mochi, you can also boil it in the water until soft. You can also use a microwave to cook mochi. In a small bowl, put a mochi and cover with water. Microwave it until it’s soften. Homemade Anko recipe : click here. Thanks for clarifying that, Nami! Always thought that mochi is anything as described by most non-Japanese! So now we know that mochi is plain and will be called a different name depending on the filling and how it’s prepared. Great info! Dear Nami, such a wonderfully informative post! Mochi obviously is not just mochi – would you believe I have never eaten Mochi or Daifuku Mochi, ever?! 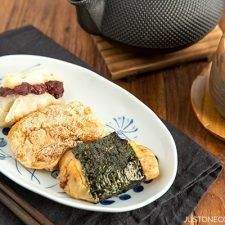 Time to get started on making these…now if I were to chose one today, I would go for the Anko Mochi, I like seaweed, so I am sure that I would love this one – although, they all look utterly delicious. My family and I really like mochi, so my mom searched up mochi recipes on youtube and came up with her own. She uses a microwave and it comes out just as delicious as the traditional ones! We use chocolate chips and peanuts instead of red bean. I brought them to school once and everyone loved it! Hi Emily! Yes microwave method is very easy but I feel like mochi gets harder soon (if we don’t eat right away). I have to try chocolate chip and peanuts with mochi! That sounds like a nice dessert mochi. 🙂 Thank you for sharing!! Our family eats mochi roasted, as you described, and then dipped in shoyu only, no sugar, then wrapped in toasted nori. We are Japanese Americans. My family is originally from Odawara. Is that why? My husband’s family is from Hiroshima, and they like it sweet. My extended family, when we have mochitsuki, has two bowls of shoyu out for dipping the freshly made mochi into–one labeled “shoyu” and the other “in-laws”! The in-laws all like the sugar mixture. Is it a regional thing, or is my family just odd? Hi Susan! Some people add sugar to soy sauce but I believe majority of people just dip in soy sauce only for Isobeyaki. I am not sure why or who in my family started soy sauce and sugar. 🙂 Unlike ozoni, I believe it’s not based on the region but it depends on family’s preference. The “in-laws” label is too funny!! Mmmhhh, mochi is so delicious! Wonderful recipe. 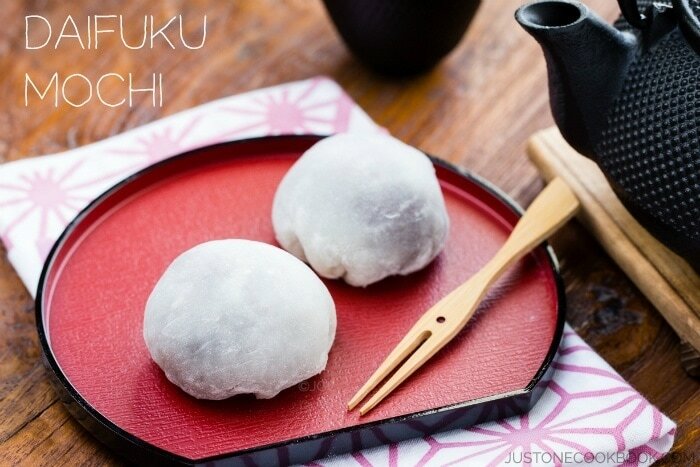 I wish I have anko mochi right now…What a great post and video? Always full of information, and pictures are amazing too! All 3 mochi versions are unique in appearance and would be very impressive on a Japanese menu. I’m surprised that making them doesn’t seem THAT difficult if you can get your hand on the mochi cakes. Excellent post, Nami! I must admit I had no idea about savoury mochi before reading about New Year’s Japanese dishes (maybe on your blog???) Then I saw the rectangular mochi bags your have featured here… I am so fond of mochi… mainly for its bouncy, chewy texture…Thank you for this clear and thorough explanation. Thank you so much for the ‘lesson’!! For some odd reason I always thought of mocha in a ‘sweet vein’ also and since I run away from anything ‘sweet’ at a fast pace, I had not learned of the savoury variety! Back to the drawing-board!! I had no idea how much I didn’t know about Mochi! Really informative post — thanks so much. Our family makes isobeyaki by pan frying the mochi in butter, instead of toasting, before putting it in the shoyu/sugar sauce. I also love mochi in a grated daikon (white radish) and shoyu sauce. I want some Isobeyaki, that sound so delicious and I like it toasted, too. Last time we tried adding mochi to okonomiyaki…and oh sooo good! Oh man, I learned so much from this post, Nami! Thank you! I totally just think sweet mochi as well and never knew about the savory version and this kiri mochi. It is all so interesting and the ones you made look totally delicious. I think the savory must be just as good as the sweet. It really would be difficult to pick a favorite. Toasted/grilled mochi is the best! So Mochi is a neutral thing, I mean, it’s not savory and it is not sweet, it really depends on what is inside, am I right? Yes, you got it right, Nydia! 🙂 It’s the white thing before seasoning. I am one of those who had NO clue what Japanese mochi was—so thanks for the detailed explanation. Hope I get a chance to sample some–I have a feeling I’d be a fan! Happy New Year, my friend!!! who knew you could buy it precut and made in the supermarket. That is so cool and i love your step by step instructions on how to do it. As always you are so great at explaining your cuisine and making all of us want to make it ourselves! I love mochi too, but I haven’t been able to get mine to puff up so much. I live in Japan but have both a fish broiler and a Western-style countertop oven. Should I use the broiler? Or should I use the oven? I’ve been using the oven at about 160 degrees C but maybe that’s not hot enough? Any advice? Hi Alyssa! We use both fish broiler and an oven toaster to cook mochi in my house (Japan). Broiler is great to make the mochi nice and toasty, but if you are not looking carefully, it gets “burnt” since it’s close to the heat source. I think 160C is a bit low for toasting mochi? I think 375 or 400? I never used an oven to cook mochi though. It will puff up like crazy, so if it’s not, I am pretty sure the temp is too low. 🙂 Hope this helps! My parents had one of those electric pounding machines and would make lots of Mochi to give to relatives on New Years as gifts. Now I make do with the precut ones. I love Japanese mochi and often order it when we eat out. Thanks to your detailed step by step instructions, I can now try it at home. Hope your week went well, Nami. Mmmm…. these look good. I’ll have to check for them at the Asian market! I love how they puff up like marshmallows when you toast them. i saw this packed block of mochi in supermarket and never bother about it before…..
That was very interesting and boy do I wish I lived near you! You always introduce me to new things because I have never heard of mochi. . Now I can be more educated when I walk through my huge Asian market– I am always clueless at 90% of the products. I do have a quick question for you.. 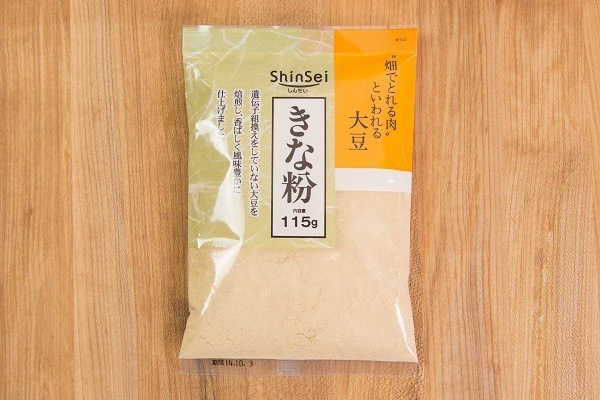 I bought some refrigerated miso… how long can I keep it in the refrigerator and still use it? Hi Ramona! So sorry I missed your “question” part of your comment earlier. You can use in 3 months or so. It can last longer but the flavor will go away gradually. Here miso imported from Japan don’t have expiration date and it’s hard to keep track. I usually finish it in less than a month (sometimes 2 weeks?). It didn’t have an expiration date too? I came across this by searching for Japanese rice cakes. I love all I have read!! I am half Japanese and love mochi but not sure where to get some. Before my mom passed, she always found some about 150 miles from here. I lived in Japan for almost a 4 years when I was young. Isobeyaki made with sugar! My favorite way to eat mochi! We grew up eating fried mochi in these styles as well. One thing we never tried was taking it along in our obento. They are so delicious that they get eaten so quick. Have you ever packed them up in obento? If so, how long before they get too hard to eat? I love your website and your vídeos, you’re a great cook!! I think your post about mochi is wonderful, really informative for people that don’t know the different types there are, can’t believe I just saw it. In my home there’s always freshly made mochi around new year, it has to be made with a pounding machine, since we can’t find packaged ones. My personal favorite is kinako mochi, although I usually don’t soak it in hot water, doesn’t it lose its crispiness??? Also I’d like to ask you, do you have a recipe for Manjū??? Those little steamed buns filled with anko, I love them, but I’ve never know how to make them. Thanks for all your great work Nami!!! I added Manju recipe on my list. Thank you! How do you store mochi? I recently made mochi myself (actually I jsut made it right now!!!) and I was wondering: Should I put it in the fridge? Should I wrap it in cellophane and leave it in my kitchen cabinets? so please, even though I know you uploaded this AGES ago, Could you please answer? Hi! I just bought some of the hard mochi cakes to use for a Girl Scout event about Japan. I want to boil them to make them soft for the girls to try it at the event. I appreciate your recipe and ideas of how to flavor it for them!! I do have a questions – how long will it stay soft after it is boiled. I may have to prep this ahead of time and hoping it doesn’t harden back up before the event. Hi Linda! Unfortunately mochi is something that you HAVE TO eat when it’s just cooked… to enjoy what mochi is all about – that elastic, springy, chewy, mochi-like texture (there is no word for it in English), you have to cook and eat right away. Otherwise, it’s very unpleasant. Just chewy, hard, rice block. Will stay soft for… maybe 10-15 minutes? If you can use a portable pot (boiling) or microwave, you can cook right before you pass the food. Otherwise… this kind of mochi is not meant to be served after. Dessert mochi stays soft because mochi includes lots of sugar. Hope this helps! Thank you for the reply. Sadly it is not the answer I was hoping for. I don’t know if we will have access to an electrical outlet in order to take items to prep the mochi right there or not. One other thing we found was similar – Sanshoku Dango – which seems to be colored mochi wrapped around red bean paste. They are in small balls that do stay soft and I could cut them into pieces to serve. We also found Kashiwa Mochi – sticky rice cakes wrapped around red bean paste and then wrapped in an oak leaf. That mochi also seems to stay soft and sticky. I may just go with one of those. We were also planning to play a video of a mochi pounding – so we were looking for the sticky rice that comes from the pounding. Anyway, thank you again for the response!! Hi Linda! I am so sorry. The sweeten mochi (made with sugar) tend to last longer for 2-3 days, and it’s perfect for events like yours. I don’t have Sanshoku Dango recipe (I should make it…), but here is my dango and other sweet mochi recipe. I recommend practicing ahead of time, at least once. Mochi is sticky, and if you don’t know what to expect, it can be a disaster…. so practice run really helps! Yes, you hit the nail on the head! Americans only seem to know of daifuku mochi, which is aggressively marketed as just “mochi” here in the US. They even have a freezer full of ice cream mochi at Whole Foods now where you can buy them a la cart for $2 each. Yikes! 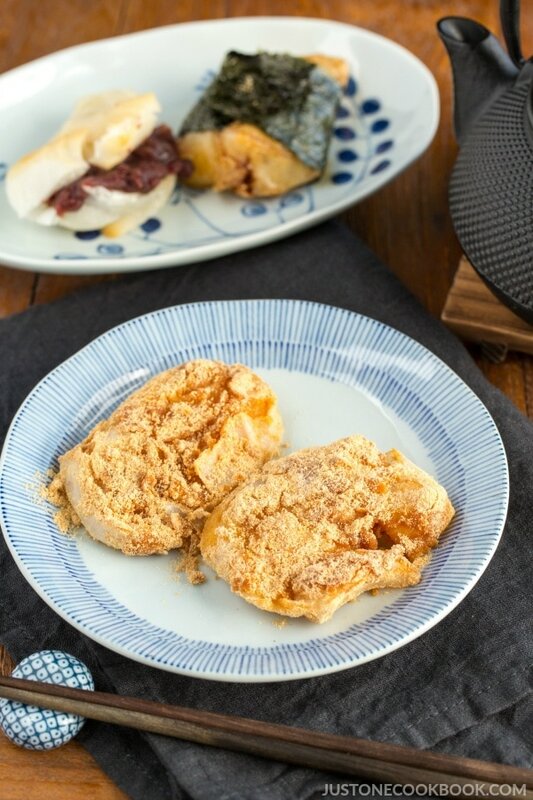 Your recipe taught me these great and easy ways to enjoy mochi! I made all three! My favorite was anko mochi. Isobeyaki mochi was my second favorite. Finally, kinako mochi was also very nice! I would eat anko mochi as dessert or snack, Isobeyaki mochi as a snack or appetizer, and kinako mochi would be delicious with tea! Do you have a favorite now from the three in this recipe? Hi Lion! When Japanese people hear mochi, first thing in our mind is this mochi we eat in new years, not the sweet kind as we have different names (such as daifuku mochi, dango, etc), but anything similar texture is considered “mochi” in the US. I guess it’s a good that people start to even recognize what mochi is. 🙂 But it’s more work to correct them saying “no, that’s not what we consider ‘mochi’ in Japan”…. LOL. Yeah mochi ice cream is pretty popular and I feel it’s even more popular here than Japan. It’s interesting. Me too, my son and I love aburaage & mochi! Thank you Lion! Do these mochi have to be eaten fresh ? I want to make them for party treats, wonder if I can make it a day before. I make mochi with my tiger mochi maker – if I want to make an filled mochi ( like manju/daifuku, do I have to make it with mochiko? I just realized if I make it with fresh mochi it will have to be eaten right away or it will dry up – it looks like your instruction shows to grill the mochi then put an in the middle and eat right away? You can make daifuku with freshly pound mochi BUT it gets harder when you keep it. To make the mochi softer and last longer, sugar is added and it helps a little bit, but the fresh one just becomes too hard. So if you plan to eat right away, sure! My instruction above is how to eat Kirimochi (or fresh mochi) and it’s not daifuku or manju (different things). Hahahahaha…I’m one of those people who wonders to do with those squares of rock hard mochi. Now I know what to do with it. I I tried the freshly grilled ones in Japan but never knew that it was this simple. Can I substitute the kinako with Korean Kong garu (roasted soybean powder) or misutgaru (roasted mix grain powder)? Hi! I recently bought a pack of kirimochi, whats the best way to store it? Thank you!